For maximum flexibility handling of specific color spaces is left to appropriate filters. 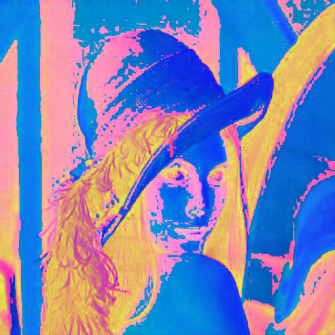 A 3-channel HSV image displayed as RGB. 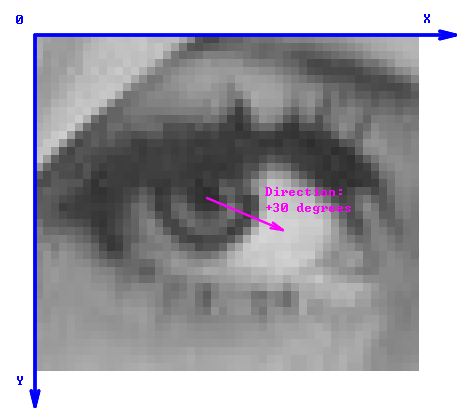 If w and h are the image dimensions, then all real-valued coordinates within the image are included in the ranges from 0.0 to w and from 0.0 to h (right-open). The top left pixel of the image covers the square area with the top-left corner at (0.0, 0.0) and the bottom-right corner at (w, h). The X axis is directed to the right, the Y axis downwards. Angles are in degrees – from 0 to 360. For directions, the angle 0 denotes the direction of the X axis, i.e. the direction from left to right. The angles increase in the clock-wise manner. First in the buffer comes the upper-left pixel. Then follow the remaining pixels of the first row. Channels are interleaved, i.e. all components of a single pixel are located at neighboring memory addresses. There might be a memory padding at the end of each row (including the last one) to improve memory alignment. The offset of the beginning of the k'th row is equal to 'k * pitch', where 'pitch' is the byte-distance between consecutive rows. Due to row padding this might be different than 'pixel_size * width'. A region of interest, if required, is supposed to be provided as a separate object. Maximum image dimensions are 65536 x 65536. /// Iff the format is different then recreates the image (pixel data will be own). /// Typically used for (re-)creating output images in image processing functions. /// be owned externally (this image will not delete it in the destructor).